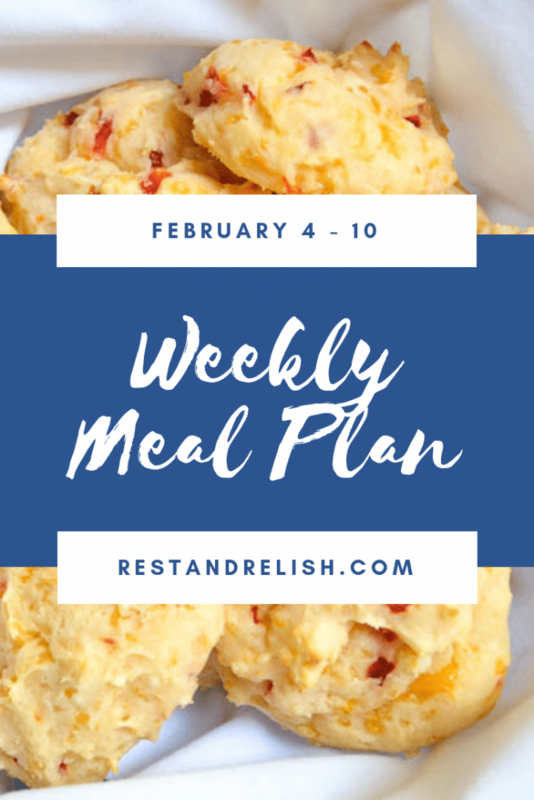 Rest & Relish Weekly Meal Plan – February 4 – 10, 2019 includes six easy vegetarian or pescatarian dinners with simple substitutions for vegan and gluten-free diets. This week’s Rest & Relish Weekly Meal Plan includes three vegetarian options, a vegan bowl, two pescatarian meals and modifications to make most meals gluten-free or dairy-free. A hearty salad is a great dish to kick off the week. The pescatarian option will include shrimp, romaine lettuce, grape tomatoes, avocado and hard-boiled eggs. Pick your favorite dairy-free dressing option and you’re set! I like my lime vinaigrette and I’ll make extra for Tuesday’s meal. Meat-eaters may substitute turkey or chicken for the shrimp and add bacon. If you like blue cheese, feel free to crumble a little on top of your salad. Vegans can leave the shrimp off and still have a very filling salad. Meal Prep Tip: If you like to meal prep at the beginning of the week, hardboil the eggs on Sunday to save time on Monday. Also, make sure to prep extra of all of your ingredients for lunches the next day or two. My Tangy Southwest Quinoa Bowl is another great meal to serve at the beginning of the week. Your vegetables are generally at their freshest and if you’ve meal-prepped earlier then your quinoa and vegetables ready to go. Another great recipe to double for leftovers! Shakshuka is so quick and easy for a middle of the week meal. Sauté 1/4 cup chopped onion, 1/2 red bell pepper, chopped, one clove of minced garlic, and your favorite spices. Try cumin, red pepper and salt. Add a large package of crushed tomatoes and cook for approximately five minutes. Create four divots in the sauce and crack four eggs into each divot. Cover and cook for five minutes. Plate and serve with Easy Pimento Cheese Biscuits. Omit biscuits if you’re gluten or dairy-free. Leftover Tip: Save some of biscuits for breakfast or lunches the next day. Alternatively, bake the biscuits earlier and reheat for Wednesday’s dinner. Cook salmon according to your preference and serve with tzatziki and a Greek salad. Quick Tzatziki Recipe: Combine 1/2 cup yogurt with one clove minced garlic, 1/4 shredded cucumber, 1 tsp chopped mint and a pinch of salt and pepper. Meat-eaters may enjoy this meal with grilled chicken in place of the salmon. This Friday is a freezer meal for our family. I have some homemade tomato soup in the freezer, so I’ll defrost that earlier in the day (or the night before) to heat this evening. Add a few grilled cheese sandwiches and call it a night! Who doesn’t love a warm sandwich on a cold winter night? I was scrolling back through my Sandwiches and Wraps Recipes board recently and rediscovered this pin. A vegetarian spin on a classic dish is always fun to try!